“Abide in me, and I in you. As the branch cannot bear fruit by itself, unless it abides in the vine, neither can you, unless you abide in me. I am the vine; you are the branches. Whoever abides in me and I in him, he it is that bears much fruit, for apart from me you can do nothing” (John 15:4-5). Yes, Christ is the vine, and we are the young branches in union with Him who are told to “abide.” However, the mistake we make so often when reading this passage of Scripture is that we immediately begin to try to figure out what we must do in order to abide when the point of the imperative being given here is simply that we are to receive. Thus, we miss altogether the indicative statement being made, and that is that all the nourishment we need to produce fruit comes from the vine (Jesus Christ), and not from ourselves. This must first be acknowledged before we will see the fruit of true obedience, an obedience that flows from the heart and is not just an outward action in an effort to conform. Let’s consider the new growth on a grapevine. Obviously, the new growth is helpless and unable to do anything to support the vine from which it is attached. The tendril goes on to maturity, by resting there in union with the vine, receiving all that it needs to grow in strength, endurance, and fruitfulness from the vine itself. If it becomes separated, it’s fate will be death. You see, it is not our ability to bear fruit that is the focus here. The emphasis is to rest in Christ’s ability and His dedication because of His amazing love for us, to transform us and produce the fruit He desires of us. This passage is all about Jesus Christ, and His promise of devotion and affection to produce in and through us, fruit. It is not about what we ourselves need to try to do, separated from Him. Christ clearly tells us, we can do nothing in our own efforts. 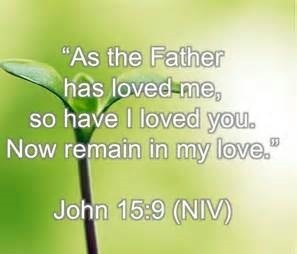 However, as we know and abide in His love by believing Him concerning His love and what He has done for us, and as we expose ourselves to the Word of God, and rest in His promise concerning what He is doing in us, we are continually cleansed (John 15:3) and we are guaranteed to bear fruit. In other words, yes, we are called to obey God. Our love is seen in our obedience to Him. But, our obedience is not a life of striving. The fruit of obedience doesn’t come before receiving the nutrients from the vine, which are only received if we are abiding. We abide by trusting wholly in Christ, not ourselves. True obedience is a by-product of what God has planted and is tending within us. We must leave our self improvement programs and efforts, and our tendency to trust in ourselves, and instead, trust fully in Jesus Christ. We must trust in His love for us, believing in what He has d one and is doing in us. We can believe and rest in our union with Him in order to absorb all we need to produce fruit as His life flows into us to nourish our souls. Jesus said, “I’ve loved you with the same intensity of love that my Father has for me” (John 15:9). Believe that this kind of love is possible and that it is yours.” Rest in this love and He will see to it that you bear the fruit He has intended for you. Furthermore, notice I said “for you.” Each branch will bear the same kind of fruit, yet perhaps a different amount of fruit, according to the Lord’s desire and plan, so don’t get caught up in comparing your fruit to another, resulting in either condemnation or pride. Remember, to rest in His love and promise, and know it is His ability not yours, to produce fruit in your life. It is all about Him and what He has done and is doing.